The Bosch AquaStar 1600H uses Bosch's patented hydro ignition technology to generate a pilot spark from the flow of water. Like a hydro dam producing electricity, the 1600H system ignites the burners when water is flowing without the need for electricity or batteries. This patented technology is only available on Bosch AquaStar tankless gas water heaters. There is no pilot light and no electricity required. 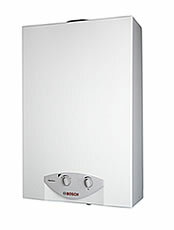 The Bosch 1600H has replaced the Bosch 125HX tankless water heater.